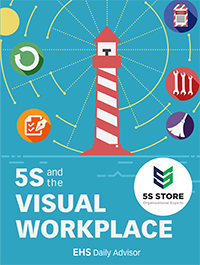 BRENTWOOD, TN (July 2, 2018)—The EHS Daily Advisor®, in conjunction with sponsor the 5S Store®, has released a new research report, 5S and the Visual Workplace. The report is based on a 5S survey launched in April 2018 that polled 520 environmental, health, and safety (EHS) professionals regarding how their organizations are using the 5S system, where visual controls such as red tag area signs, shadow boards, and site boards are used to improve safety by making information readily available to employees. The pillars of 5S are Sort, Set in Order, Shine, Standardize and Sustain. Many are taking these principles a step further to include Safety—a sixth S! Nearly two-thirds (62%) of survey participants have either partially or fully implemented a system based on 5S principles. The #1 visual element used by participants’ organizational safety programs is a the use of visuals for fire extinguishers and fire hose cabinets—87% of respondents employ this type of signage. 11% of participants indicate that their visual safety program has saved their organization between $10,000 and $25,000 annually. 37% of respondents have no red tagging policy, a central element of the “Sort” concept of 5S. When it comes to the “Standardize” concept of 5S, 39% of participants have created and implemented a standard that both management and employees follow that standardizes practices for cleanliness and order. 59% of those polled believe that their EHS program could be significantly improved if their companies instituted 5S principles. Nearly one-half (44%) of respondents educate employees on the 5S system during toolbox talks. From their humble roots in the town of Pepperell, Massachusetts, The 5S Store has grown considerably. The company has outgrown the original home office space, moved into a bigger office park, and its expansion continues across the United States. From day one, The 5S Store has helped corporations and people find solutions to their biggest process improvement problems. The 5S Store has all the products you’re looking for—in one place—and the advice you need to drive success. With over 100 vendors in their network, they’ll be sure to help you find what you’re looking for at the right price. Look for The 5S Store, coming 2018 to the Levittown/Philadelphia, PA area!